The Teric is Shearwater's new watch-sized dive computer! Buying any Shearwater dive computer is an investment in a great piece of equipment that will last you many years. The Teric is no exception. This is a watch sized dive computer that meets the needs of Technical and Free Divers. The Teric will serve you well in shallow reefs, deep wrecks, and cave diving, and is small enough to be used as an every day watch. This has all the functionality you'd expect from Shearwater Research, plus a bit more. If you already know the Teric is for you, click the button below to see the latest price and any discounts that may apply at Amazon. Otherwise keep scrolling to read our Shearwater Teric Review. Clink on the link below to see the answer to your most pressing question, otherwise keep scrolling to read the entire Shearwater Teric review. What’s the difference between the Shearwater Teric and the Perdix AI? What about the Teric's watch functions? Which Decompression Model does Shearwater Research use? What Maintenance is required for the Teric? This video will give you an idea of the Shearwater Teric's overall size. Watch sized dive computers are usually more expensive than traditional dive computer with similar capabilities. That being said, the Shearwater Teric includes additional features not found on the Perdix AI. It doesn't replace the Perdix AI, it just has different features. Free diving mode - this has Ascent and Descent indicators suited for free diving, and logging can be configured down to 1 second intervals. Timepiece Mode - The Teric is small enough to be worn as an every day watch, and comes with a selection of watch faces. Configurable 4 button menu (versus the 2 button menu on the Perdix AI) - you can set one button to give you one-press access to specific functions. Options for Haptic (vibration) and audible alarms. 316 Marine Grade stainless steel case and menu buttons. AMOLED Display - this gives exceptional readability underwater with very vivid colors. A sapphire crystal display - Sapphire crystal is scratch resistant. Rechargeable battery (the Teric is charged by placing the unit on its docking station). Options for 5 different color bands, or changeable with any other 22 mm watch band type. What's the price difference between the Teric and the Perdix? You can buy the Shearwater Research Perdix AI for under $1300 including the Air Transmitter. If you go with the Perdix AI without the transmitter, these are currently selling for around $950 USD. 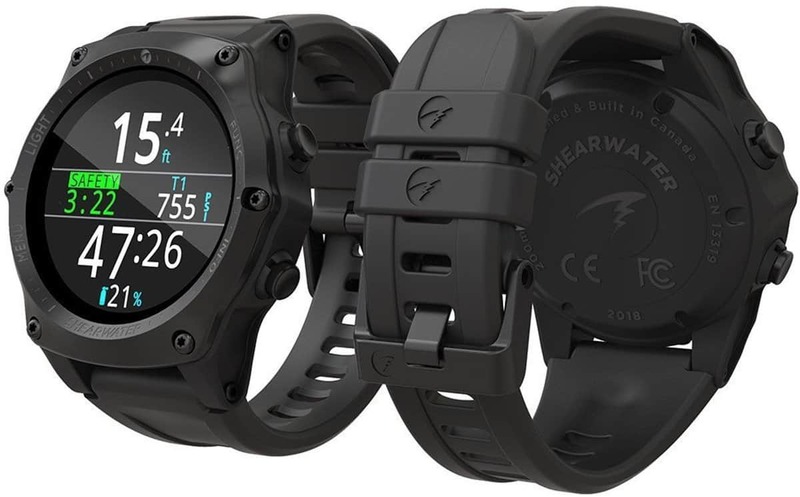 The Shearwater Teric on it's own is priced anywhere between $1095 and $1200. With the air transmitter included, this comes in between $1500-$1600. The Freedive Mode shares most features with other dive modes, but it also has several unique features. This mode has Freedive focused Information screens, including Last Dive Time and Max Depth displayed on home screen. By default, the Freedive mode uses the Big Layout. Like in OC Rec and Gauge Mode, in Freedive Mode, the right home screen slot can be customized in the Big Layout. 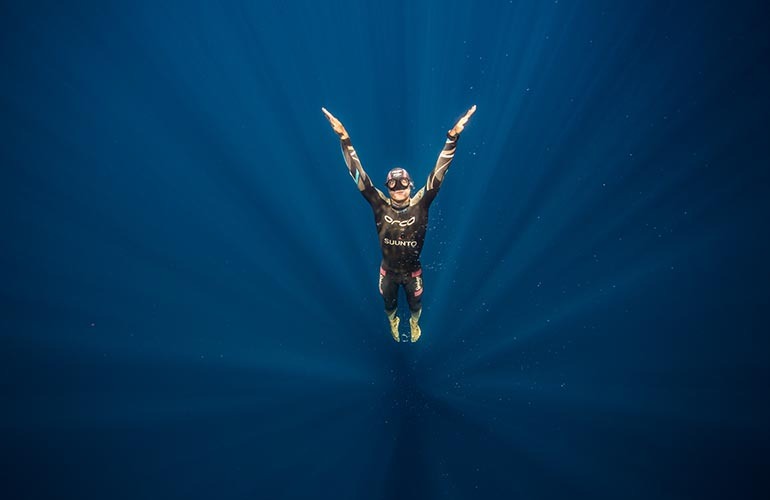 As decompression tissues are not tracked during Freedive Mode, changing to or from Freedive Mode resets the deco tissues. Ascent / descent shown in feet per second (fps) or meters per second (mps) instead of fpm / mpm. Shearwater's focus is on innovative and simple displays to keep the most important information easy to read. Take a look at this introductory video below on the Teric functions. Screen Display - The display is sapphire glass which is scratch resistant and comes in as a 9 on the Mohs scale of hardness. There's very few things that will scratch it. Diamond is a 10 on the Mohs scale so would be an example of something that can scratch sapphire. Quartz, for comparison is a 7. Full color, high resolution, AMOLED Display - The display is 1.39" (35.3 mm) across with deep blacks, and vivid color. There's a BIG LAYOUT display setting to enable larger fonts. This can eliminate the need for "gauge readers". 4 Button Menu - Shearwater dive computers have always been intuitive when it comes to navigating the menu. The Teric has a 4-button menu so it's become even easier. You can program one of the 4 buttons so that it gives one-press access to either the diving or watch tools such as the stopwatches, compass, log tagging, etc. Home Screen Options - Instead of a mini compass on the home screen, there's a North Arrow that moves around the outer edge of the watch. The home screen can be customized to show tissue graphs on the outer edges of the watch face. The Teric automatically turns itself on and enters Dive mode as soon as it's submerged. It doesn't have wet contacts so this is based on the increase in pressure, and not on the presence of water. Although you should always turn on the computer before each dive to check the battery level and its setup, this feature is a backup in case you forget to turn it on. When auto-on is activated, the Teric defaults to the last configured dive mode. It's easy to customize this dive computer to display what's important to you. The dive number can also be changed - It doesn't have to start at Dive #1. It can be adjusted to match the actual number of dives you've done. The Teric has the capability to connect wirelessly to a PPS air transmitter. This is an optional accessory. The transmitters are not included in the price. If you don't want wireless air integration or your budget doesn't stretch this far at the moment, then this is something that can can always be invested in later on. Every Shearwater air transmitter has a unique serial number. The transmitter is screwed into the first stage of your regulator, and the serial number is entered into the Teric the first time you use it. 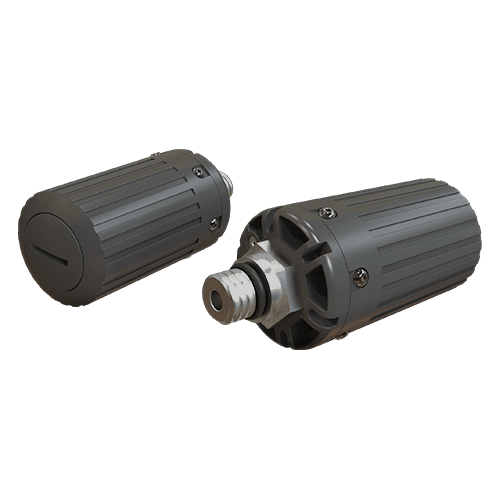 It can connect to either one or two transmitters which gives you the option of monitoring two tanks and allowing for side mount diving. Sometimes, the little things that make all the difference. 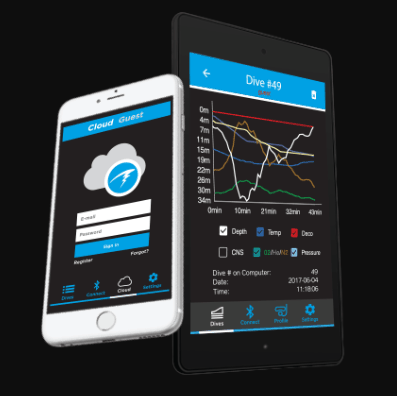 Download and display dive logs quickly with Bluetooth Smart technology. The Teric dive computer comes with Bluetooth. This lets you to download your dive logs from the dive computer effortlessly to your phone, desktop or tablet. This is Mac Windows, iOS and Android compatible. You can then view, edit and synchronize your dive logs. Bluetooth also makes regular firmware updates and upgrades very easy. The computer does all the work. On the surface, the Watch Mode is the default mode for the Teric. In Watch Mode, it will always remain on, but in order to preserve battery, the Teric will turn off after 20 minutes if it detects no motion. 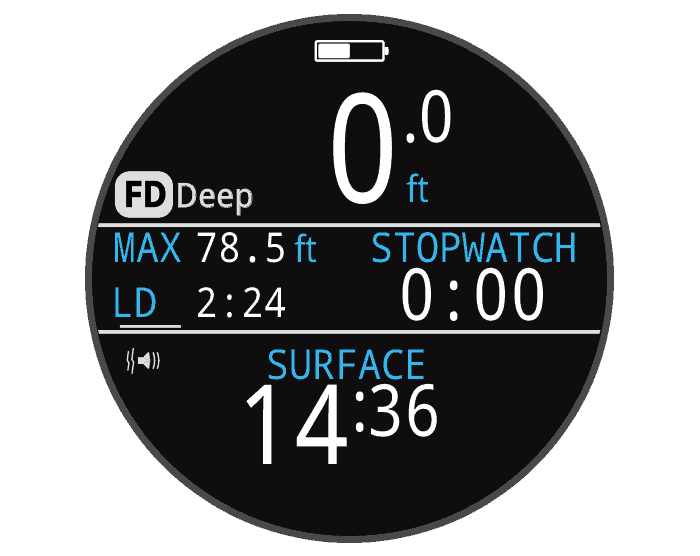 If the dive computer is left in Dive Mode at the surface, it will timeout after 15 minutes and switch back to Watch Mode. 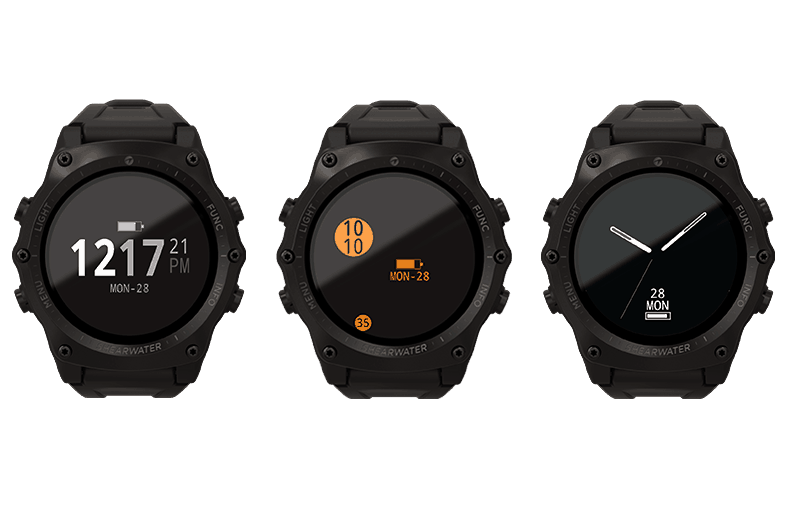 The Teric is able to display 3 different style watch faces. These are Analog, Digital and Orbits. 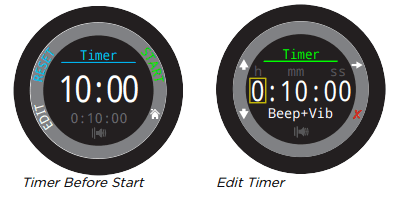 Each watch face can be displayed with varying amounts of information. 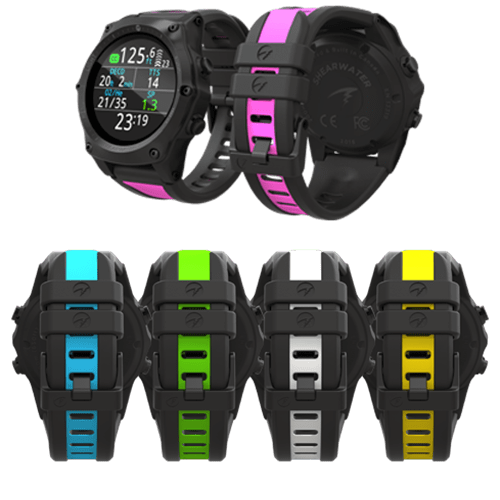 There are 15 different watch face colors to choose from giving over 100 possible watch face appearances. Access to the Watch Tools is only available when in Watch Mode. 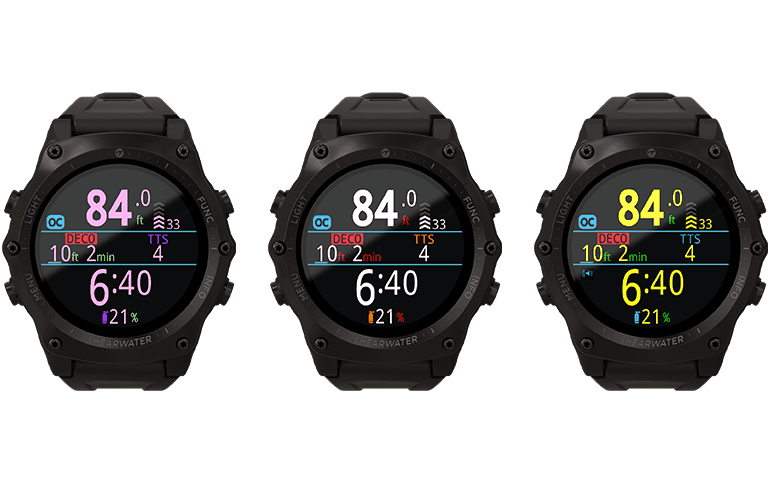 This gives access to all of the basic watch features including the Alarms, Timer, Stopwatch, Flashlight and watch face selection functions. There are two available options for time format, 12-hours and 24-hours. Two independent alarms can be set, and a snooze duration is adjustable. Each alarm can be scheduled to go off once a day, Everyday, only on Weekdays, or only on Weekends. The Alarms in Watch Mode do not share notification settings with the Dive Mode alerts. Timer The Teric’s timer runs in the background, and can be edited to count down up to 10 hours. The timer will run in the background and a DONE notification will sound even if the watch is “turned off”. The stopwatch will run across all modes on the Teric. For example, a stopwatch started in Watch Mode will continue in any diving mode until it's stopped. 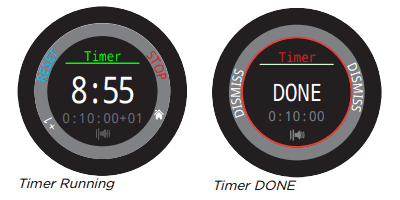 By default, the stopwatch is displayed on the home screen in Freedive and Gauge Mode, but it can be included to show in any dive mode. The stopwatch has a 10 millisecond resolution and will run for up to 24 hours in the background, even when the Teric is “turned off”. The flashlight function turns the Teric screen on full brightness to provide an emergency light source. This function is only useful in the darkest of rooms or caves. Shearwater includes a durable, stretchy silicone black strap with the Teric. This is designed to grip a wet suit or dry suit without sliding around. An extender strap is also included, if you need extra length. The strap is fastened to the Teric via stainless steel watch lugs. These can be easily removed and replaced with two standard 1.5 mm hex screwdrivers which are also included in the box, along with additional lug screws. There are Pink, Blue, Green, White and Yellow dual-color wrist band options. These are optional extra's at an additional cost. The strap size is 22 mm so this makes it easy to switch to most other 3rd party band options if desired. The Teric doesn't measure water depth directly. It measures the water pressure then converts this to depth based on the assumed density of water. Salinity settings on the Teric can be set to Fresh, EN13319, or Salt. The EN13319 value is between Fresh and Salt and is the European CE standard for dive computers. Teric's default value setting is EN13319. Shearwater Research design and manufacture their trimix dive computers with the most demanding technical divers in mind. The standard decompression model is Bühlmann ZHL-16C with Gradient Factors (GF). Wash your dive computer with fresh water at the end of each dive in salt water to remove salt and other contaminants. Never allow salt deposits to build up. Detergents or other cleaning agents will damage the Teric, so only use fresh water when rising. Never wash with high-pressure water as it may damage the depth sensor. Allow the dive computer to dry naturally before storing. Keep it out of direct sunlight in a cool, clean, dry and dust-free environment. Avoid over exposure to direct ultraviolet radiation (the sun). It also doesn't like radiant heat. Shearwater has a 2 year warranty on all of their products. Each dive computer is tracked with a unique serial number so it doesn't need to be registered after purchasing. This is transferable to the next owner if sold. Once the warranty period has passed, the computer should be serviced on an annual basis at your nearest service center. Shearwater Research Inc stand behind all their diving products like very few others do. Shearwater Research provides after-sales customer service that is unparalleled. Shearwater as a company, are committed to providing the best sales and customer service experience they can. Their Customer Service is excellent and their products are backed up with video tutorials and easy to read manuals. These are designed to help you quickly get comfortable with your dive computer. Shearwater make reliable dive computers that are easy to use and read in all diving conditions. Owners of Shearwater dive computers claim these are the best dive computers they've ever owned. 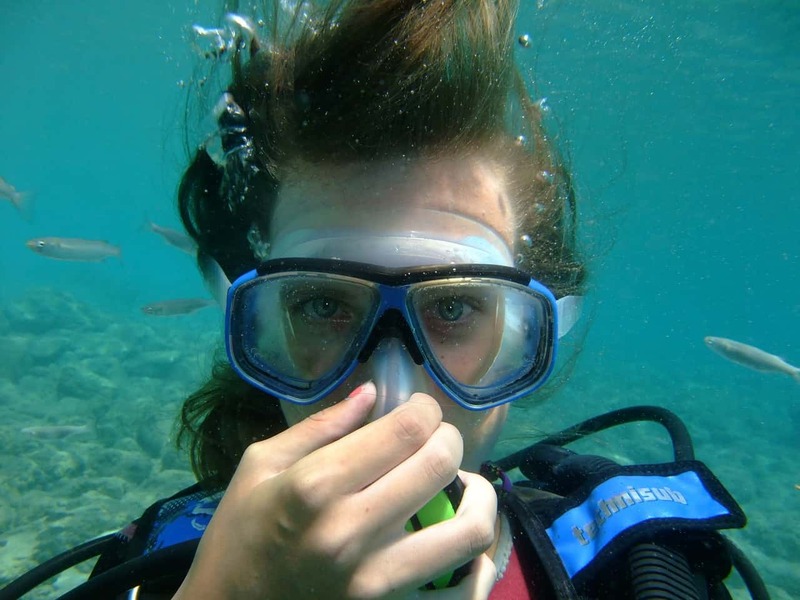 Comments such as this are repeated time and again across Scuba forums such as Scubaboard. As for long term return-on-investment, previous dive computers made by Shearwater such as the Perdix and Petrel, retain very good resale values. If you ever had to sell one, you'll find that it will hold its value very well compared to its competitors. If you're looking for a watch-sized dive computer, then it's hard to go past the Shearwater Teric. Ready to buy a Shearwater Teric with a wireless air transmitter? 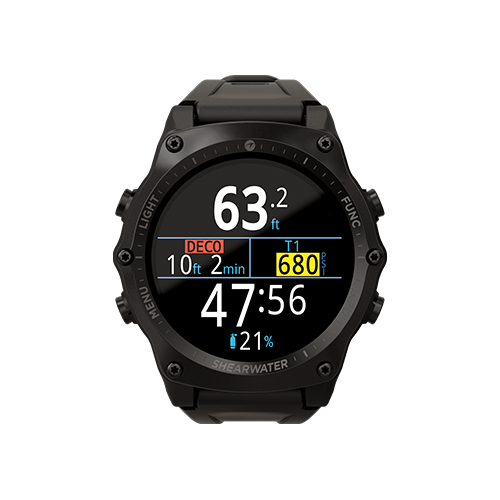 Click the button below to see the current price and any discounts that may apply for the Shearwater Research Teric Dive Computer at Amazon. Ticked this off my wish list! This is as good as it gets in dive computers. Shearwater Research is the best when it comes to customer service. If you’re serious about your diving, then this is the dive computer for you. Yet to buy this but it looks like such an amazing dive computer. Definitely, one to put on my Christmas wish list.